Movies' March With The Military As Old As Hollywood Act of Valor, a film that opened last weekend and earned nearly $25 million, was commissioned by the Navy's Special Warfare Command to drum up recruits for its elite SEALs program. But it's by no means the first movie made with the military's cooperation. The film Act of Valor, commissioned by the Naval Special Warfare Command, uses active-duty SEALs and professional actors to tell a fictional story. The movie Act of Valor, which opened in theaters last weekend and earned nearly $25 million, was commissioned by the Navy's Special Warfare Command to drum up recruits for its elite SEALs program. But this is by no means the first movie made with the military's cooperation. Hollywood's relationship with the military can be traced back to the 1927 film Wings, which won a Best Picture Oscar, says Jordan Zakarin, an editor with hollywoodreporter.com. That film was proposed to the Department of War, directed by a veteran and given planes, guns and other military equipment. But the partnership between Hollywood and the military didn't truly blossom until World War II. "They knew that the burgeoning medium of film was very important to get public support," Zakarin tells Audie Cornish, host of All Things Considered. Walt Disney's studio made many famous glory-filled films, he says, including some that in hindsight seem almost like caricatures. "But at the time, they really drove support," he says. There was a divorce of sorts between Hollywood and the military during Vietnam, and it lasted at least until 1986, the year of Oliver Stone's classic Platoon. But what really turned things around that year was Top Gun. "Oliver Stone and Francis Ford Coppola — they did not want to work with the Pentagon," Zakarin says. "They didn't want to change their message. So it was a bit of a difficult time, but then Top Gun came out and made a lot of money and they realized, 'Wow, we can do this on the cheap, get a lot of promotion and look real good.' "
Zakarin says the military worked with producer Jerry Bruckheimer on the film and even placed recruitment tables outside movie theaters. 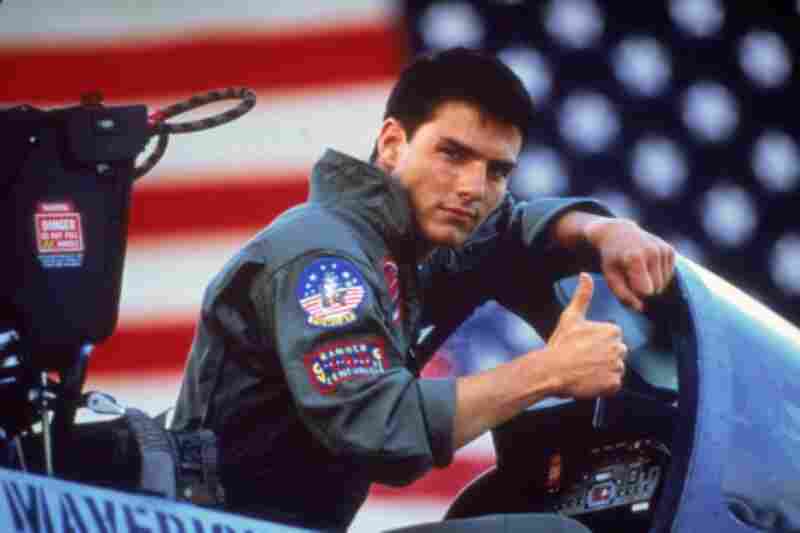 In 1986, Top Gun ended the rift between Hollywood and the Pentagon that began during the Vietnam War. "I think what happened was that it was long enough ... after the Vietnam War ended that filmmakers and studios realized that they could do this little bit on the cheaper side and make a lot of money," he says. "And ultimately that's beyond message. That's what it comes down to in Hollywood." How it works: The Pentagon requests five copies of a script. It has to be informative and must help in recruitment. "They don't want a movie that'll make the U.S. look bad even if it's, you know, based on a true story," Zakarin says. He cites the example of 2002's Windtalkers, set during World War II. It had a character called the dentist who would take gold fillings out of fallen Japanese soldiers' teeth. "Even though it was true, it didn't reflect really well on the military, so they had them take that out," he says. Ultimately, Zakarin says, the dominant ideology in Hollywood is what makes money. "We've seen a lot of movies that are very good [and] a number of films that fell short of the box office despite being critically acclaimed," he says. "Maybe Hollywood's realizing that maybe people don't want to see difficult war on their TV screen after seeing it 24-7 on CNN, on Fox News, so maybe now they're into a little bit of escapist entertainment." In that vein, coming to your local multiplex: director Peter Berg's Battleship and Zac Efron in The Lucky One.